Lewis J. Beilman III lives in Hamden, Connecticut, with his family, dog, and two cats. He writes fiction in his spare time. His stories have appeared in Foliate Oak Literary Magazine, ArLiJo, Reed Magazine, and other literary publications. In 2009, he won first prize in the Fred R. Shaw Poetry Contest. Outside of writing, Lewis enjoys reading, playing soccer, and volunteering in his community. He has a law degree from the University of Maine Law School and a bachelor’s degree in political science from Sacred Heart University—but he is first and foremost a writer. You can find out more about Lewis at www.lewisbeilman.com and on Twitter and Instagram @LJBeilman3. As a child, I moved a lot. By the time I was in high school, I had lived in Florida, Connecticut, Texas, a few other states, and Germany. That exposure to different places and different cultures helped make me open to accepting new things and being less judgmental toward people who aren’t “like me.” I think that exposure continues to help me view situations and characters through different lenses. I started writing poetry in high school but stopped writing creatively when I was in college and law school. Eventually, after law school, I decided I didn’t want to be a lawyer and got a job for a short time as a journalist and editor. I started writing poetry again then (a little more than 15 years ago) but switched to fiction about seven or eight years ago. Primarily, I consider myself to be a short story writer. I’m very excited to have my novella, Fourth of July, published by Scarlet Leaf Publishing, and I’m hoping many people will read it. I’ve had several short stories published in online and print journals over the last few years, but my ambition is to have a collection of stories published. Currently, I have an unpublished collection called The Changing Tide, which I’ve submitted to agents and a few contests—so far with little success. It would be nice to see that collection in print someday. In the meantime, I keep writing stories and expanding my body of work. Q: Where can we buy or see your published stories? Links to my published stories can be found on my website, www.lewisbeilman.com. Also, my novella, “Gina and the Dolphin, which is in the collection, Garden of the Goddesses, and my stand-alone novella, Fourth of July, are available on Amazon at https://www.amazon.com/s/ref=dp_byline_sr_book_1?ie=UTF8&text=Lewis+J.+Beilman+III&search-alias=books&field-author=Lewis+J.+Beilman+III&sort=relevancerank. Q: What was the name of your last book? Give us an insight into your main character. What does he/she do that is so special? What’s it about? My book is called Fourth of July. It’s set in New York City and is a satire about privilege run amok. The main character, Ogden Goodman, is a wealthy lawyer who, harried one evening by boredom, hires a homeless man to perform for his family. The “success” of that evening's performance leads Ogden—and others he knows—to engage a variety of characters in a host of increasingly outrageous and disturbing activities. The story was written before Donald Trump became President of the United States, but it is eerily—and unfortunately—relevant today. A friend told me that the book is likely to make many readers uncomfortable, but these are uncomfortable times. People—particularly Americans—should be discomfited. Ben Affleck, definitely Ben Affleck. (That’s an inside joke. My brothers will get it.) If not Ben Affleck, maybe Matt Damon. In any case, either one of them can contact me if they want the movie rights. If I don’t answer my phone, they can leave a message. I’ll get back to them. I have a full-time job. I try to write for 45 minutes to an hour a day before I go to work. I used to be better about keeping this schedule—but, when you have a family, dog, and two cats, it can be hard sometimes to squeeze in that writing time. Occasionally, I have an idea for a short story that comes out of the blue. Usually, though, I just sit down to write and a story starts to form. Later, when I’m running or walking the dog, I’ll ruminate on the idea for a while and flesh out the story in my head. As I work on the story day-to-day, it generally stays pretty true to the course I’ve plotted in my head. Finding time to sit and write is the hardest thing. For me, the best time to write is in the morning before anyone in the house is awake. It’s when my mind seems to be the clearest—and I don’t have to struggle with distractions. I don’t think there’s anything particularly easy about writing. I read a little bit every day. My favorite authors are William Shakespeare, Kurt Vonnegut, Milan Kundera, and J.M. Coetzee. For short stories specifically, I like Raymond Carver, John Cheever, Junot Diaz, and Jhumpa Lahiri. I read print-edition books as opposed to eBooks—but only because I’m technologically inept. At some point, I’ll make a further stride into the 21st century. I’m reading Churchill and Orwell: The Fight for Freedom by Thomas E. Ricks. I like to rotate my reading between fiction and nonfiction. I proofread and edit my own stories. Someday, perhaps, that will change. I wouldn’t mind having an editor to challenge me at times. Ironically, physical activity helps me to relax. I play soccer, run, walk the dog, do yoga—these things seem to clear my mind and help me focus. I particularly enjoy playing soccer in an Over-40 league. I find that the world slips away whenever I’m on the pitch. I play winger mostly, but I’m more George Worst than George Best. Slaughterhouse Five. Of all the books I’ve read, I feel it contains the most perfect blend of sadness and humor. Write, write, write. Like most things in life, the more you do something, the better you tend to get at it. ​Set in New York City, Fourth of July is a dark tale of privilege run amok. Ogden Goodman is a wealthy lawyer who, harried one evening by boredom, hires a homeless man to perform for his family. The success of that evening's performance leads Ogden--and others in his circle--to engage a variety of characters in a host of increasingly outrageous and disturbing activities. Lewis J. Beilman III crafts this satire with skill and humor and creates a world that seems, at the same time, both absurd and all too real. ​Teodora Dumitriu was born and lives in Campina, Romania. Passions: children, books and English. Sometimes, she writes. Funnily enough, I used to be an engineer because I’ve always loved the poetry of mathematics too. Spent twenty-eight years in the field of Power Engineering. Switched this year to teaching English to small children – an old dream come true. School years have had a huge impact on my whole life. Teachers made me see the difference between doing the thing(s) you love and just doing your job. I used to be an avid reader and a curious kid anyway. School made me develop a fascination for the dynamics of teaching and learning, of giving and receiving. School years made me even more curious about the whole of existence. Well, to begin with, I’m not yet a writer/poet – and my wish is to become one. You know, I took the question very seriously and began to make a list: Rumi, Yeats, Neruda, Hafiz, Baudelaire, Robert Frost, T.S. Eliot, Sylvia Plath, Maya Angelou, Mary Oliver… and at some point the ridiculousness of the list made me laugh, feeling like a donkey rating and labeling birds’ voices in order to DESCRIBE the way they inspired it (the donkey) to sing. Then the hypocrisy of name-dropping made me sad - there are many non-famous poets whose names I can’t remember (out of laziness and carelessness - Internet era, everybody’s out there, so much to read and you just skip the names sometimes, go straight to the verses and then jump from one webpage to another, from one thing to another and can’t find your way back) but whose poems equally made me GASP. Goodness me. ALL poets inspire(d) me – by making me ache with the wish of being able one day to make one poem that would make one person gasp. And then another. And another. And if I were to pick only ONE poet that I love, that would be e. e. cummings – his poetry simply makes me ANGRY it wasn’t ME who wrote it! . In English, PRECISELY 12 [sic] poems FINISHED (I’d add a LOL, the editor permitting). A bit more prolific in Romanian. 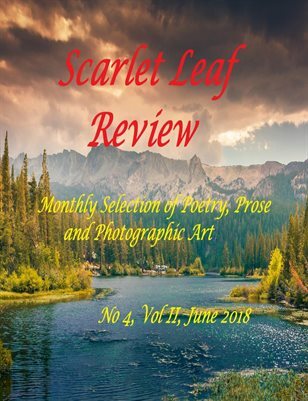 Every poem I ever wrote so far is here, within The Scarlet Leaf Review. Trying to convince myself it’s the right time to try to find that splendidly unyielding frame of mind so as to stop procrastinating and begin thinking seriously about beginning to refurbish a moth-eaten writing called The Game. It’s a kind of patchwork prosetry which sort of sums up random thoughts that crossed my mind some times … based on rhymes - that are meant to distract the reader from noticing that there’s no structure, plot or reason and metaphors - to mask the author’s apprehension for precision. Funnily enough, sometimes i see pictures in a flash but look for words to paint them until the cows come home; some other times words just whizz by splashing against the canvas/paper like crazed colours, so fast so fast so fast that the ear/eye can’t keep up with the nonsensical mess... BUT these ones are the best sort – basically, in a few months/years they write themselves (you just have to find something productive to do meanwhile). I’m getting used to using fewer and fewer adjectives. In English - DEFINITELY phrasal verbs. Hanging around, hands in pockets, in a state a total bliss, while an equally elated doppelganger scribbles, frenziedly, the BEST verses you’ve ever read. Usually, in the morning, they (the verses) look different. Oh, I get it all the time. My method is simple, low-cost and effective: cross out-replace, cross out-replace cross out-replace until it sounds really TERRIBLE and you get REALLY mad. Then tear up the piece of paper (very, VERY small bits) and SWEAR you won’t be doing the bloody thing EVER again. Then QUIT (for a few days/weeks/years). Do the dishes, make babies, walk the dog, get a PROPER job. You won’t believe the SURGE of inspiration this method brings forth. Oops, I’ve disclosed THE tip. Yes, I do use PAPER. The advantage being that i can destroy the abhorred words THEMSELVES and not another innocent object that happens to be around – which makes the ritual, as stated before, HIGHLY effective. Used to be a voracious reader; not anymore – who knows why. Twain, Vonnegut, Thackeray, Tolstoy, Twain, Rushdie, Hesse, Voltaire, Twain, Coelho, Huxley, Tolkien, Twain. All the aforementioned poets. Oh, and Mark Twain. Paper books FOREVER (nothing whatsoever against Kindle, BUT). Am re-re-re-re-re-reading Narcissus and Goldmund. And it’s only the interviewer’s fault! Seriously now, NOTHING compares with re-re-re-re-re-re-reading a book that you love. Huck Finn’s "All right, then, I'll go to hell”! “Narcissus and Goldmund” – Hermann Hesse. Mark Twain. I’d like to hear him speak. I was born in the ‘50s in the Northeast corner of the US. I was brought up in the small town of Hampton New Hampshire, the oldest of 6 kids. I believe that ALL experiences, whether school in the ‘60s, work, or play, parental support, all contribute to my writing as a career. I was basically ‘invisible’ during my school years. I was pretty shy and didn’t say much. English was a pretty good subject although, at the time, I had NO idea I would decide to fall back upon it and make it a huge part of my life today. I want to continue writing poetry and short stories, and strive to keep those reading my work fully entertained and wanting more…..to be recognized by my peers with my recent Nomination for “Best of the Net” Poetry is a dream come true and I look forward to what tomorrow might bring! I would have to say, Edgar Allan Poe, Sylvia Plath, Leonard Cohen, Shakespeare and as writers go it would be Stephen King. I have been seeking publication of my Poetry and Short Stories since 13 November 2015 and have thus far had 280 officially published pieces all over the Internet and in Print/Anthology venues. I’m now co-editor on the new Anthology, “Dandelion in a Vase of Rose”, with my dear friend and Editor Michael Lee Johnson. I’m working on my own book titled, “The Cellaring” which will be available through Amazon just before Halloween. I’ve always enjoyed horror, dark work, paranormal, etc….although I also write many poems on Nature. I started writing at about 13 years old. I had a guitar, learned to play and decided to write my own lyrics for songs….it blossomed into poetry and after 40 years, I’ve decided to write full time. This is a good question, I would say I have a lot to express, something inside gives me the love of the written word that I share it with everyone.The force, I would say, is a blessing. My ideas come from experiences in my past, and everything from television, movies, books, conversations with people and, yes, even conversations with myself, my cats or dog…. I’ve work very long and hard to branch my creativity from simple rhyming poetry to special formatted free verse work. Yes, every writer will experience ‘writer’s block’. I use art to help me work through it. I find a picture, and starting from left to right, I write short observations of what I see in the picture, ie: the birds on the branch, snow along the creek, sun behind the pines…..etc….and then I put it all together, fill in areas that need it and work my way out of the block and into a nice poem. “The Moonlight Dreamers of Yellow Haze”, ‘Dandelion in a Vase of Roses” and my own book, “The Cellaring” covers were made by me and my Digital Art program. Yes, it can make or break the book. The old adage, “a picture is worth a thousand words” is the truth, the potential buyer looks at the cover first….imagination kicks in, and they’re ready to buy the book if that cover ‘catches’ their eye…. I relax by going outside and sitting under the tree with a cold drink. I love walking in the woods at night and find great peace watching Thunderstorms. My own quote has always been my favorite: “When the Mind has Left; then go Write” written and copyrighted in 2011. Perhaps looking at a nomination for the Pulitzer Prize in Poetry. Poe, I would LOVE to meet him and just listen to him talk over a drink. Gregory T. Janetka is a writer from Chicago who currently lives in the outskirts of San Diego where he is inspired by pretty things. His work has previously been published in Foliate Oak, Flyover County Review, Gambling the Aisle, Deltona Howl and The Flash Fiction Press. He is terribly good at jigsaw puzzles and drinks a great deal of tea. More of his writings can be found at gregorytjanetka.com. I grew up in the western suburbs of Chicago, went to college in D.C. then bounced around between Chicago and Orlando before moving to Alabama and finally San Diego, where I currently reside. Chicago, however, will always be home and consistently finds its way into my work. I began creating stories in my head in order to help me fall asleep when I was very little. Soon after I started writing them down and haven’t stopped since. Absolutely. I was lucky to have many great teachers across many disciplines. What stood out to me across all subjects was the storytelling aspect. If the teacher was a good storyteller I’d pay more attention and get more out of the class. I loved English in terms of reading and analyzing texts but when it came to all the grammar rules I immediately lost interest. Writing has rules and formulas, of course, but breaking it down to that level seemed like an attempt to kill the magic that words and language inherently possess so I just went with what sounded and felt right and was correct about 95 percent of the time. Of course like any writer I’d like to be able to survive by writing fiction alone but realizing how unlikely that is, all I can hope for is the time to always keep writing no matter what else happens in life. As far as published work I have had a number of short stories and poems in literary magazines, but have also finished a novel and a novella and am currently seeking representation for both. I have major issues with focus and so am always working on multiple projects. The two main ones at the moment include a short story dealing with the tenuous nature of friendships and the beginnings of a second novel set in early 1900s Chicago. I suppose what I write usually falls under the general heading of literary fiction. My novel and novella, however, are historical fiction as I find it easier to fictionalize and distance myself from the real life events that inspired them. Also because I know what it’s like to live in my own time period and want to better understand and explore how others have lived in the past. I’ve always loved writing stories but didn’t seek to do anything with them until a few years ago. Out of a feeling of duty, and because I figured no one would ever want to read my stories, I studied political science in college. I spent time in class, however, filling the margins of my notebooks with story notes and ideas. The desire was always there, lurking. In December 2013, I quit my job in order to travel the country for 80 days and finish my novel and haven’t looked back since. I’d love to write full-time but without being independently wealthy that’s not an option. I write what I can when I can, usually bits at a time. When you truly love something you’ll always find a way to do it. We’re always surrounded by endless ideas but who knows what makes us see some and not others. And what makes us run with one over all the others that we do see. I love that there is mystery to writing. I’m not sure I have. An idea comes and I write until everything in my head is down on paper or until my arm literally goes numb and I can’t write any longer. I let that, whatever it may be, sit until I have some distance from it then I go back and see how to possibly structure it and what basic components, if any, it is missing. Finding the time and quiet in which to do it. The fact that there is always more to be explored, always more words and language to play with. I’m not sure I understand the idea of writer’s block. If you’re a writer, you write. What you produce may be junk but everyone writes junk. If one story gets held up or isn’t working you move onto another. Writer’s write. To me reading is as nearly as much a tactile as it is a mental experience and so I prefer traditional books, used ones if possible. The feel of the pages, the smell of them, of taking a pencil to them to underline great sentences, to holding in my hand a well worn book that has been read who knows how many times by how many people, of taking that journey that they’ve taken and seeing what they’ve left behind, be it notes or dog-eared pages or coffee stains. Reading is anything but a solitary experience. I’m not sure I’ve ever been able to. The Great Gatsby. My high school English teacher Mrs. Smith assigned it for class and to her I will forever be grateful. Those sentences, each a treasure. That’s how I wanted to write. Not to just come up with stories but to be a storyteller. That work led me to the rest of Fitzgerald’s work and to a love of the Lost Generation of the 1920s. Ideally embodying the cliche of living in a small Parisian apartment near the Seine with my love and my cat, drinking copious amounts of tea. In reality all I know is I’ll be scratching out my little stories somewhere. Don’t change anything, just pay close attention as it will all be useful one day. Have great adventures. And always carry a pen and paper with you. Once an idea is gone it’s gone. I just want to say thanks to Roxanna and Scarlet Leaf Review for this opportunity! Retired attorney. Practiced 1973-2008 in Illinois. Retired and moved to Texas 2011..
Not good at English grammar but wrote clever funny essays that my last English teacher liked and gave me good grades. None. I’m too old to have a writing career. I only have one career to look forward to, death the final career. Just silly stories for online magazines. I have never have decided to become a writer. Part time three or four stories a month. I’m sixty nine. Old people have seen a lot. Thinking back it’s easy to come up with ideas. No. At same level as I was in high school. Outline it in my mind and see where it goes from there once I start typing. Forcing myself to start typing. Once I get going it’s hard to quit. I read fiction, mysteries and contemporary thrillers, non fiction history and biographies, and short story collections of a literary nature. A book about the Jewish resistance to the Nazis in Poland during WWII. “You’ll never learn any younger.” My father’s father used to say that to me when I was little. He would then proceed to learn me about whatever it was that he was just talking about. Even if my old age based on that I try to learn something new every day. Nowhere I’m too old for a future. Thank you again for printing what I have sent you. I really appreciate it. Good luck with your magazine. I can see that you have all the necessary spirit, desire, drive and ambition to succeed. I’m sure you’ll be successful. Thank you Mr. Grafton, both for your kind words and for your valuable contribution to our magazine.